Moving time: 8 hr 3 min. Wind: ENE winds at 10 mph all day(finally). Weather: 65°F (18°C) in the morning; got up to 85°F (29°C) by the end of the ride at 5:00pm. Clear in the morning; cloudy for last 30 miles. 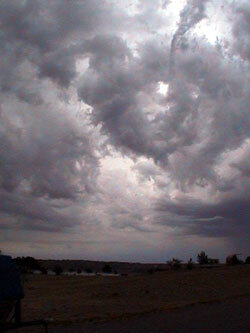 Thunderstorm at 4:00pm that lasted about 15 minutes. I waited it out in a bike shop. We're definitely not in Kansas anymore, Toto. I did my biggest day of the trip so far. Eight hours and 124 miles after I started I ended up in Pueblo, Colorado. 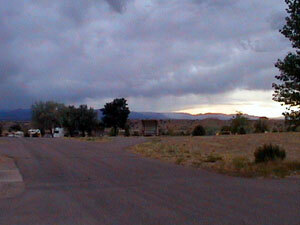 Pueblo is the second largest city on the route with 99,000 residents. Only Eugene, Oregon is larger. 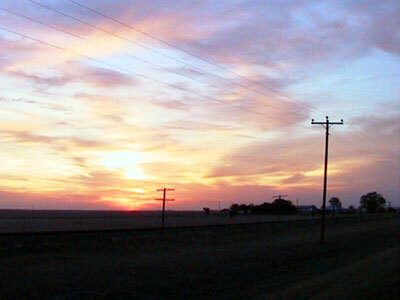 Here is a shot at sunrise looking toward a farm just west of Eads. 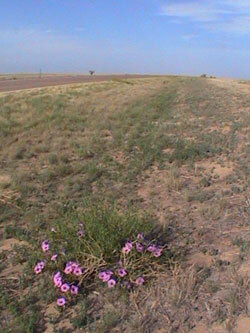 Here are some rare flowers along route 96. They bring a burst of color to a very brown, dry, parched landscape. I saw prarire dogs today for the first time. I was expecting to see them in Kansas but had to wait until I was on US 50 just east of Pueblo to catch a glimpse of one. They are smaller than I expected and they run pretty funny. I tried to get a picture of one but they run down their little holes when I get anywhere near them and they never come out. I wasted about 10 minutes trying to get a single shot of one. The change in topography and vegetation today was very easy to notice. The first half of the ride was the typical eastern Colorado that I was familiar with. By Ordway the vegetation began to turn from brown to green. Around Olney Springs I started to make out the silhouette of the Front Range off in the distance and by Boone there were some knobs sticking out of the ground. The Front Range really starts here in Pueblo and the mountains look imposing. Everyone tells me that the grades are not nearly as bad as the Appalachians - they are just long. In the next two days we will climb from 5000 feet to over 11,500 feet at Hoosier Pass. 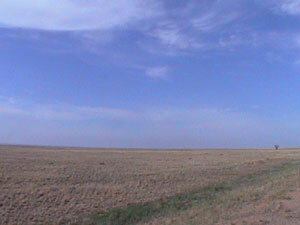 Here is a shot of a typical desert scene early in the day. Here are some pictures taken at our campsite. Notice the passing thunderstorm and the mountains. Today was my third mail drop. When I researched post offices online before I left the USPS web site indicated that general delivery packages are accepted at all post offices. When I arrived in town at the designated post office they told me that there was only one post office in town where they handle general delivery packages. Luckily it was no far off route and was near the bike shop. I picked up my supplies and shipped a bunch of stuff home. I bought a new helmet at the Great Divide bike shop in town. It has a visor and a little more ventilation than the one I have been using. The visor is the big upgrade. I inquired about some other gears too but they didn't have any 7-speed cassettes with more than 30 teeth. My derailleur can handle mega cassettes like those with a 32 or 34 tooth sprocket. They also didn't have any 28 tooth chainrings so I'll have to continue with what I have. Joe blew a tire just before the campground. Since we're half way through the trip he decided to rotate his tires so that the fresher one will be on the back wheel. Rear tires wear faster than front tires. Geert made it to camp pretty late today. He had to take the same post office detour I did to pick up his Western Express maps and had dinner at a restaurant. 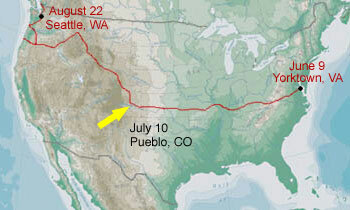 We are scheduled to part ways tomorrow anyway since he begins the Western Express route toward San Francsico in Wetmore, Colorado. Joe and I will continue to ride together as long as we can stand each other and our schedules and paces jive.